In this SuperfastCPA review, Jared shares how he used SuperfastCPA to pass his CPA exams after struggling with the amount of information in his review course. “Hi, guys. My name is Jared. I’m a CPA. And I pretty much had every bit of that thanks to SuperfastCPA. 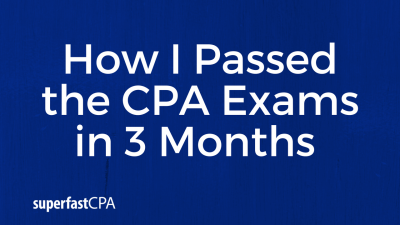 About two years ago, I finished my master’s degree and decided I would apply to sit for the CPA exam. I was accepted as a candidate and I started studying. I started with FAR because I heard that you should start with what you do on a daily basis because that’s typically going to be the easiest. About a month and a half into studying, I took a review test and realized that I didn’t remember anything from a month ago and with two months of studying left to go, I figured this is going to be pretty much impossible, so I gave up. About a year after that, I accepted a position with another company with one condition being that I had to finish my CPA in 12 months. I asked if I could have 18 so I could have six months to get used to the job and then another 12 months to study for the test because most people can pass within a year. Well, my about four months came up and I realized, okay, I better start getting serious and start studying. So, I started studying for FAR again and I realized after watching the videos, actually hand writing notes, reading the textbooks that came with the study software and everything like that, that I could not remember anything I had studied in a month and a half ago and that I was probably going to fail this test. So, I’ve got kind of, not depressed but kind of down on myself and realized this is going to be very hard, this a better job, higher pay, higher level, I really don’t want to lose it because I can’t pass this test. 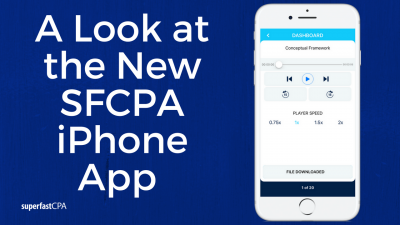 So, one day I was browsing through Facebook and I see an ad pop up saying, “I passed my CPA exam in three months” and I thought, well, I highly doubt that but, worse that can happen is get some spyware on my phone. 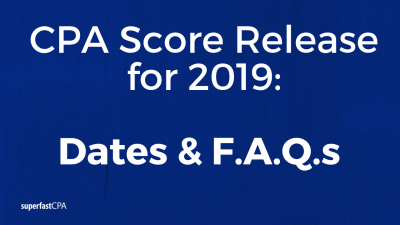 So, I clicked on the link and I followed through it and I read the introduction and Nate actually show you his scores showing that he did, in fact, pass all three tests in three months. And in fact, he shows he failed the first one and then managed to take two within another month and a half or so. So, I thought, “Okay. This might not be such a bad idea.” So, I ended up buying the study program and it was absolutely worth every penny. His methods allowed me to finish all four tests in about nine months and two tests actually delayed a month because of family problems that arose, and I didn’t study at all during that month. I was still able to come back and pass those on the first try. So, I did fail one test and that’s because that morning I had a terrible morning, kind of went in with a bad attitude, but just studied for it again and passed it with flying colors.